HOTTEST DAY OF 2010 with a run at 100-degrees in Greater Washington DC. Highest temps will focus the DC to Philadelphia corridor, whilst low 90s sizzle New York to Boston. Highs expected are…. 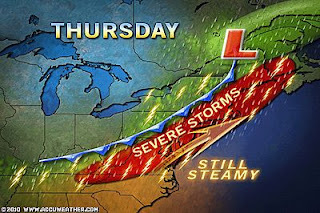 Washington 100, Philadelphia 98, New York 94, Boston 91… STRONG TO SEVERE THUNDERSTORMS TO BLOW FROM MID-ATLANTIC TO NEW ENGLAND, STAY SAFE FROM HEAT AND SEVERE STORMS TODAY! On your Thursday, you folks in the southeast will have the same routine as we’ve been seeing with storms concentrated down along the Gulf Coast where temps by day are hanging around the 90-degree mark but as is expected, it’s very muggy indeed and regular storms are blowing up even during the morning hours as the Texas centered high spins moisture in allowing the instability as the air is warm even at night and begins to build as the sun reappears on the horizon. As for inland areas it’s sunnier, drier, slightly less humidity but air temps are warmer than down along the stormy Gulf coast. Mark’s City-Cast as follows: Atlanta, Ga, Hi 94 (DP 70-73), Lo 75 (mostly sun), Montgomery, AL, Hi 96 (DP 68-74), Lo 76 (Mostly sun), Charlotte, NC, Hi 96 (DP 75), Lo 79 (mostly sun), Jacksonville, FL, Hi 95 (DP 68-73), Lo 80 (PM Storms), Biloxi, MS, Hi 90 (DP 74-78), Lo 79 (Stormy), New Orleans, LA, Hi 91 (DP 74-79), Lo 79 (Stormy). Florida will see typical PM Storms, highs ranging from around 90 on Gulf and Atlantic beaches, inland areas will see highs warm into the mid-90s with some spots where no storms form topping 96-98 degrees! Lows range from around 80 on the coast to mid-70s inland! Today will see storms along the southern boundary from Beaumont, TX all the way to San Antonio, down to Brownsville, further north it’s sunnier and hotter with mid-90s around Lubbock and west Texas to around 98 for Dallas. Highs along the Gulf will range from 88 to 93 degrees. Houston will see storms with highs around 93 degrees, Lows will be warmest near the Gulf with around 80 in Galveston, mid-70s for interior Texas. Downtowns od cities will always be a few degrees warmer than surrounding rural areas. Today signals a few changes for the northerhn plains to lower midwest region. It will be a warm, sunny picture basically across the board but points down around the Kansas City to St Louis corridor will see storm chances higher today and indeed a marked cooldown for St Louis with only mid to upper 80s expected today! Both Chicago and Minneapolis will enjoy mid-80s with good spells of sun. It will in fact we warmest up across North and South Dakota with plenty of sun and high which may top 90 in a few spots in North Dakota, certainly mid to upper 80s across the board! Enjoy. The big warm-up has arrived for folks from the Calif-Mexico border to Salt Lake wher the sun will blaze and skies cloudfree. That is of course the rule for the Southwest anyway, however the upper-level ridge has intensified and shifted west and will support the warmest surface readings of 2010 for many areas this afternoon. Desert communities will be enduring highs surpassing the 110-mark with one or two places perhaps eyeing 115-degrees, dangerous heat folks, so take it easy out there, especially from Phoenix to Death Valley and out to Palm Springs where all these spots will be pushing 115 I think. Some relief will be had along the Pacific with 70s for the beaches, even 60s from Big Sur all the way up to the Oregon beaches, including the Bay Area with morning cloud/fog expected, and a noon to PM sea breeze developing as the interior heat up, you know the drill… around 80 for the Los Angeles basin and upper 80s to mid-90s for coastal valleys and canyons.. well over 100 for once you enter the deserts. A warm day in coastal and coastal plain areas, HOT for inland areas, especially east of the coastal mountains. Across the central Rockies from Salt Lake to Denver the ridge scorching the deserts will heat both Rocky Mountain cities into the mid-90s today! Can Flooding in the Midwest Actually Help the Gulf Oil Spill? After a fairly cool day with a dreary rainy, overcast sky which prevailed most of today. It was in fact welcome from the recent dry pattern which will once again resume. It was a meere flirt actually as there was simply very little rainfall which would even wet those very dry soils across much of Scotland and indeed the sun has been shinning strongly over much of the UK mainland, south of Scotland, so the drying out of soils continued to deepen with a sun which supported low 80-degree surface readings from centrak to southern England. Up here in Scotland I expect a mix of sun and cloud with a high between 70-73 degrees and perhaps my much anticipated mid to upper 70s on Saturday. As for central and the southern interior of England, we should see highs (likely on Saturday) warm towards 86 degrees and perhaps may take a run at the 90-degree mark, somewhere between Heathrow, central London and Gravesend. Then a slight cooling trend kicks in next week, which is a topic I shall discuss soon (next week’s weather). It’s finally surpassing the 110-degree mark for Phoenix as the ridge finally shows some intensity as you’d expect for this region at this late stage in June. As for the Mid-Atlantic, the heat has been glaring at the chance of seeing a run at 100 degrees for Washington DC. All you needed to look at was the dry soils which cover much of the Eastern US and the shear persistent heat that blistered the South and it was only a matter of time before DC eyed a 100. That number may occur several times this summer and perhaps the first 100 for Philadelphia may occur since August 2002 soon enough. A dull, dreary cool day with outbreaks of showers but mostly periods of a fine drizzle, especially over higher ground!